All our teaching styles are committed to the needs of our students, with awareness, compassion and understanding. Mara Staffieri is the co-founder and director of the Prema Shanti Yoga and Meditation Retreat Centre. Mara began her yoga practice in 1986 and has been teaching yoga since 1996, holding yoga retreats, auyervedic workshops, in Europe, Zurich, Australia, and New Zealand. Mara has also being teaching in teacher training’s in Zurich and New Zealand. Her yoga philosophy and style has been influenced by Iyengar, Astanga and Satyananda yoga traditions. Accreditation with Yoga Alliance 200. Over the 25 year period that she has been practicing and teaching yoga, she has developed her own unique vibrant teaching style which is dynamic, inspirational and motivational, underlined with sound anatomical, physiological and bio-mechanical principles, emphasizing Intention, Breath and Movement. The cornerstone of her teaching philosophy is the idea that the concepts of Yoga must be first understood through the body, and the dynamic, conscious practice of asana, and meditation. The Prema Shanti Yoga and Meditation Retreat Centre was created to facilitate Mara’s teaching methods, which are a blending of Vinyasa, Iyengar, Astanga yoga, and the teachings of the yoga sutras, coupled with her unique approach to sequencing that is specifically designed to meet the needs of today’s yoga student. 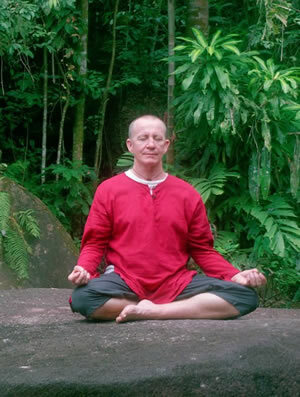 Janardhan McInosh is the founder and the vision behind the creation of the Prema Shanti Yoga and Meditation Retreat, he first began his yoga and meditation practice in Auckland, New Zealand in 1983. He has never limited his yoga training by aligning himself with any particular style of yoga, embracing all styles (i.e. Astanga, Iyengar, vinyasa, yin etc) and taking from each what works for his students, over a 30yr period has developed his own unique teaching methodolgys, being influenced by all his teachers and mentors, and their love for yoga. Yoga is his passion, and way of life, he began teaching yoga asana and meditation to students in 1997, his philosophy is to empower his students through demonstrating to them, that no matter what their physical condition or age, they can benefit from, and do yoga asana, his emphasis during his yoga classes is on correct alignment in posture and breath. He tailors his classes to the ability of the students to absorb his teaching, to their physical condition. His student’s progress quickly because they enjoy and understand what they are practising. Janardhan over the last 15yrs, has been facilitating meditation, self empowerment, teacher training, yoga retreats in Europe, Australia and New Zealand; He has lived in a meditation and yoga retreat centre (the Prema Shanti Retreat centre) since 1997 where he is the resident yoga and meditation teacher. Janardhan has accreditation with Yoga Alliance 200. Suzanne Graham is the third member of our team. A long term resident of the area, Suzanne frequently attended Prema Shanti meditations and yoga classes. A deepening call to the yogic path and life led her to complete her teacher training here at Prema Shanti under the keen eye and wise guidance of Mara and Jananrdhan. Teaching since 2006, she continues to help foster the practice and understanding of yoga, and has taught both yoga and meditation in Australia and India. Frequently living in Ashrams in Australia and India, both as a volunteer and course participant, Suzanne has had experience with a wide range of styles and aspects of yoga, and draws on her personal experience and understanding in her commitment to helping others. Suzanne is passionate about a holistic approach to wellness, and draws on a variety of yoga styles and techniques, including pranayama, mindfulness and chanting, as well as asana, to help students develop self-awareness and harmony. She believes a personalizes yoga class respecting the students’ body, lifestyle and needs can give them the greatest rewards. Integrating correct alignment and use of the breath, her classes are supportive and light-hearted yet comfortably challenge her students. She is a registered member of Yoga Australia.